Now that we have settled into a routine Homework Corner has started again. 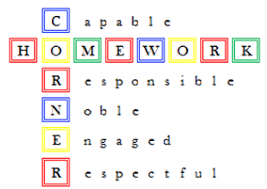 If you are unfamiliar with Homework Corner it is a smaller class size setting where students who may occasionally need a little more one on one time can go and work with a Cove teacher. Homework Corner takes place during regularly scheduled homework time. Homework Corner is not tutoring, if you are looking for a tutor please contact Janet Bryant at (904) 547-8971. If you would prefer your student to do any part, or all, of their homework at home with you please leave a note in the student’s planner for the Cove teacher.